Poultry India show is the biggest networking event in Indian subcontinent where key and strategic customers, opinion leaders, decision makers and bureaucrats merge to exchange ideas. 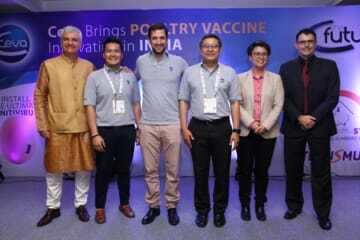 Organised at HITEX Center, Hyderabad, India between 22 to 24 Nov, Poultry India 2017 was a great opportunity for Ceva Polchem to announce launching of two highly differentiated poultry vaccines Transmune IBD and Vectormune ND. Thanks to a strong campaign by Ceva Polchem team, over 250 delegates from India, Bangladesh and Nepal attended the program at Novotel Convention Center. It was remarkable indeed to watch captains of Indian broiler industry sitting side by side to participate in the launch program along with KOLs and broiler integrators. After a traditional lamp lighting ceremony, Stephane Bordier delivered a welcome speech expressing clearly Ceva vision and aspirations for India. It was followed by two technical presentations by Dr Marcelo Paniago and Dr Jessica Lee. The audience appreciated Marcelo’s insightful speech on Newcastle disease control among broilers employing Vectormune ND. Dr Jessica’s speech on stopping the Gumboro cycle was like a wake-up call to broiler integrators pertaining to IBD control. Both speakers stressed upon the need to move towards hatchery vaccination arousing tremendous interest among broiler customers. Ceva team comprising of Dr Nitiwat Kaepoowat , Dr Guillermo Gonzalez, Dr Chalermchai Skulphuek got a chance to mix up with the elite customers and KOLs during cocktails post presentation. The launch program kicked off a fascinating journey of Ceva Polchem into a vibrant Indian market.